The king of the rodas shows off his samba. Remember when you heard Leon Redbone sing Lulus Back in Town for the first time? That old-geezer voice emanating from a young throat was startling. Gallotti is startling in the same way. This young man is not afraid to use a hefty measure of gravel and vibrato on a repertoire of samba oldies while playing the cavaquinho. Not only can he sound like an old geezer, but he does a mean old woman, too. Ive never heard anyone come so close to singing like Clementina de Jesus (in the O Que É Que Eu Dou medley he is Clementina). In fact, as bizarrely improbable as it might sound, Gallotti is a sort of Paulinho da Viola and Clementina rolled into one, effortlessly navigating through all the interpretative shades and nuances that span these two extreme models. With all of the above going for him, is it a surprise that Gallotti is the king of the rodas de samba? His enormous charisma comes shining through in the debut disc O Samba das Rodas, an especially delightful collection of vintage tunes that will set your foot tapping and your hips swaying. 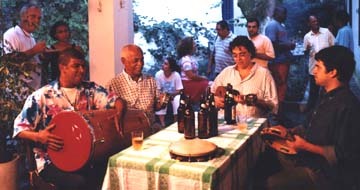 If O Samba É Minha Nobreza is a roda de samba at home, O Samba das Rodas is a roda de samba in a carioca bar, (subdued) background buzz and all. Only the smoke is missing, and I, for one, am happier without it. Responsible for the expert arrangements were Cláudio Jorge (there he is in a white shirt, standing behind Pedro Miranda) and Luís Filipe de Lima, who play guitar and 7-string guitar, respectively. 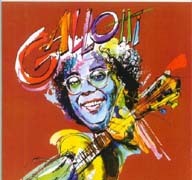 Gallotti surrendered the cavaquinho to Wanderson Martins. Eduardo Neves is in charge of the flute, Rui Alvim of the clarinet, and the large array of percussion instruments is wielded by the heavyweights Gordinho, Ovidio Brito, Marcelinho Moreira, and Tunico Ferreira. The singing gets a strong boost from a large chorus of the best and the brightest on the samba scene, including Cristina Buarque, Ari Bispo, and Teresa Cristina. Walter Alfaiate makes a guest appearance in Oito Mulheres, where he and Gallotti exchange lighthearted opinions on women. Pop open a beer and settle back to enjoy this gem. If you develop the yen to sing along, youll find all the lyrics in the CD booklet. The disc comes from that selective hothouse of samba, Carioca Discos, whose previous releases were Os Meninos do Rio with Elton Medeiros, Dona Ivone Lara, Monarco et al., and Cláudio Jorges Coisa de Chefe. Gallotti is in very good company. Gallotti is very good company. (Carioca Discos CD 003; 2002) 55:21 min.